Spirits were not dampened by the late afternoon rains as Medina Sunrise Rotarians, spouses and guests gathered together for fellowship and cocktails at Rustic Hills Country Club on the occasion of the Annual Medina Sunrise Rotary Cart Tipper Golf Classic. 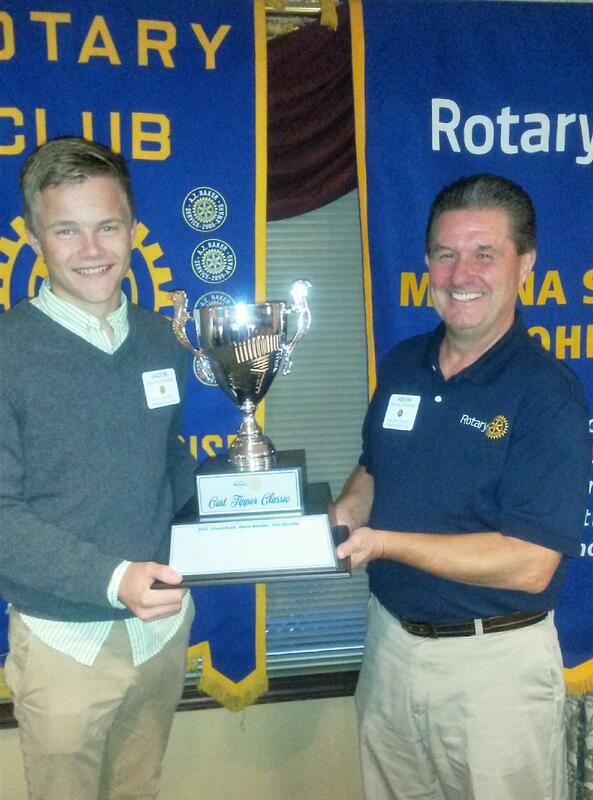 Having lots of fun and hoisting the trophy from 2017 are our own Rotary Youth Exchange Student from Germany, Jacob Scharnweber and Assistant Governor Kevin Wermer. The Golf Classic, cancelled due to inclement weather, is in its second year and was initiated to bring Rotarians, their families, and prospective members together in a fun day of golf and learning more about Rotarians and our mission to making a difference in the lives of children in our community and beyond through our time, talents, and treasure. *Rotary is an international service organization which unites more than 1.2 million volunteers from 200 countries. Together, Rotarians see a world where people unite and take peaceful action to create lasting change - across the globe, in our communities, and in ourselves. For more information or if you are considering joining us at a Tuesday morning weekly Rotary meeting, please see our website www.medinasunriserotary.com or check us out on facebook at Medina Sunrise Rotary. Contact information is provided for your convenience.